Keeping in mind that life sometimes gets in the way, please give me 24 hours to respond. Also, feel free to mix and match the decks if you wish for a more interpretive reading. Please feel free to contact me regarding your reading. I appreciate any and all feedback. I may also request to use your feed back on a testimonial page in the future. Please note that the shopping cart will be titled Mrs Colorsmith. 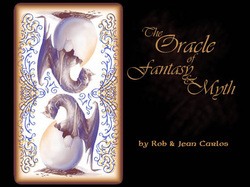 Any donations received will go towards the running of this site and the production of The Oracle of Fantasy & Myth. This deck features the work of my husband, Rob and is written by me.